BOTTOM LINE: A loose mash-up of historical and mythological figures bickering over relevance and power. Set Yet in Motion opens on Tiresias (Ken Coughlin), the blind prophet of Greek mythology famous for his clairvoyance, donning sunglasses and playing a solemn tune on a flute. He is then joined by Cassandra (Malka Wallick), the Greek mythological princess who was given the power and curse of prophecy by the god Apollo. Cassandra is crying over Apollo’s advances toward her and Tiresias does his best to comfort her. We then learn that Cassandra has taken her qualms to the Judeo-Christian God (Katherine Wessling), with a capital G, who decides to have Apollo killed. God then enlists the help of two philosophers, Immanuel Kant (Vincent Bivona) and Johannes Climacus (Christian Michael Ramirez) to perform the deed. Kant is hesitant to participate and thus God chooses him to murder Apollo alone, since his reluctance proves his understanding of the consequences. On his journey, Kant is discovered by Friedrich Nietzsche (London Griffith), in a female form, who tries to convince Kant to let Apollo live. However, Kant is able to escape Nietzsche’s seductive grips and find the arrogant Apollo (James Rieser) arguing with Cassandra. While Kant is still grappling with himself about whether or not to kill the diety, Apollo’s actions force Kant’s hand to follow through with his ultimate test from God. 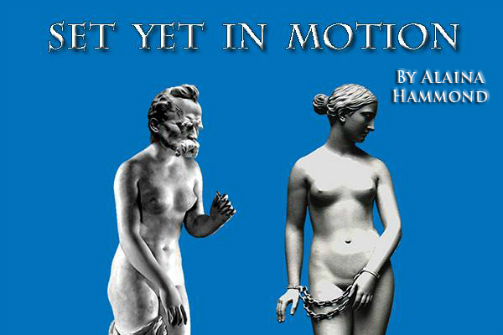 Written by Alaina Hammond, Set Yet in Motion mixes various Greek myths and historical figures with moments of rhyming text and modern vernacular. Director Micheal Bordwell succeeds in moving the series of vignettes along at an even clip and suggesting the setting with the minimal set pieces of UNDER St. Marks. Additionally, utilizing many modern clothing pieces, the costumes generally suggest a distinction between the characters that hail from Greek mythology and those that exist in another realm. The standout performances in this production are the likable, nebbishy Vincent Bivona as Kant, and the vivacious London Griffith as Nietzsche. Both actors possess ease, clarity with the text, and a clear enjoyment of their roles that made watching them a breath of fresh air in the small, packed theatre. Unfortunately, while some of the performances are enjoyable, much of the plot is full of insider philosophy jokes that were lost the audience. For example, if you weren’t aware that Immanuel Kant was a German philosopher who is considered a highly influential figure of modern philosophy, or that Johannes Climacus was a 7th Century Christian Monk who supported a divine command law of ethics—the play does very little to let you in on the humor of their arguments. All in all, philosophy enthusiasts may find Set Yet in Motion to be laugh-out-loud funny; however, I fear this interpretation may wash over the general populous. Set Yet in Motion is written by Alaina Hammond. Directed by Michael Bordwell. Sound Design is by Bennett Hammond. Publicity Contact is Emily Tuckman. Graphic Design by Richard Rolen. The cast is Ken Coughlin, Malka Wallick, Katherine Wessling, Vincent Bivona, Christian Michael Ramirez, London Griffith, James Rieser.